Ciolkowska are a Saint Petersburg, Russia based quartet whose name refers to the ideas of “Russian Cosmism”, which the R.A.I.G. web site describes as a philosophical and cultural movement that emerged in Russia in the early 20th century and was represented by various Russian philosophers and scholars of the 19th-20th century. Reading that the band formed with a focus on Space, Kraut, Jam and Experimental Rock I was especially anxious to dive in upon seeing that one member is a dedicated ukulele player. Aspera/Astra opens the set with 11 minutes of lusciously melodic Rock and a hint of Prog. Around the 8 minute mark the music explodes into a swirling cauldron of intense Kosmiche Rock that whips up a frenzy before receding once again into a meditative yet tension-laden rocking drift. I never would have guessed that the beautiful string leads were a ukulele and the instrument is a welcome presence throughout the album. Very nice. There’s an 80s New Wave and Prog-Punk with a Kosmiche edge on the short but compelling Bang-Utot (Koshmar Pirata). I like the duet between the ukulele and what sounds like a twangy droning jaw harp that permeates throughout Zauryadnaya Radost as crashing guitar and chest thumping bass gradually provoke a heavier rocking pace. Another very cool ethnic flavored and Prog inspired Psychedelic Kosmiche rocker. The aptly titled Tuda b (2dub) adds a bit of Dub pulse and swirl to the mix, and when the chant vocals kick in it sounds like we’re in Space Rock Dervish territory. Several tracks remind me of early Korai Orom’s brand of ethnic infused Space Rock. Ole Lukkoye also comes to mind and there’s a whiff of Ozric Tentacles to be detected as well. Ciolkowska have a flair for melody and a great combination of rhythmic pulse and hypnotic deep space drift. The musicianship, recording and production are excellent. The music is mostly instrumental with some vocals in Russian. 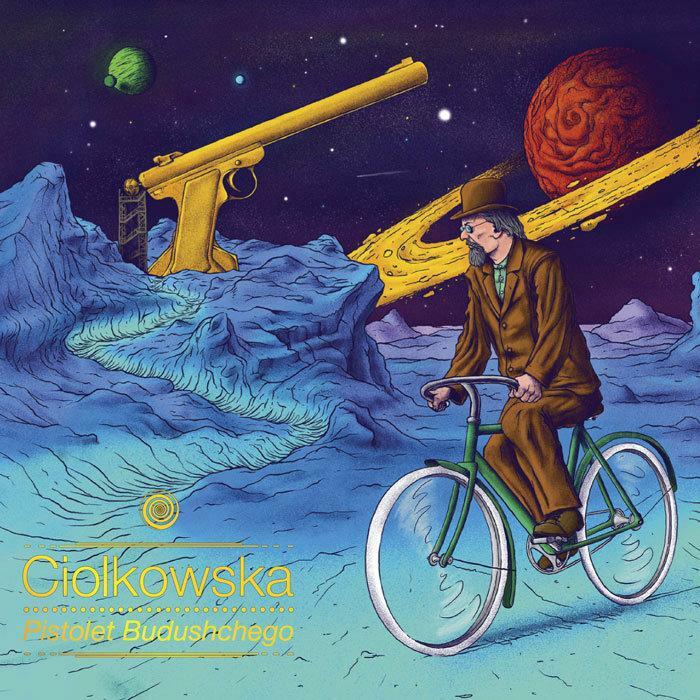 If you like ethnic flavored Space/Psych Rock than you’ll surely dig Ciolkowska. Recommended!